Hello dear friends! Although I have started to see several Christmas posts I remain firmly focused on celebrating a season of Thanksgiving. Is anyone else with me? 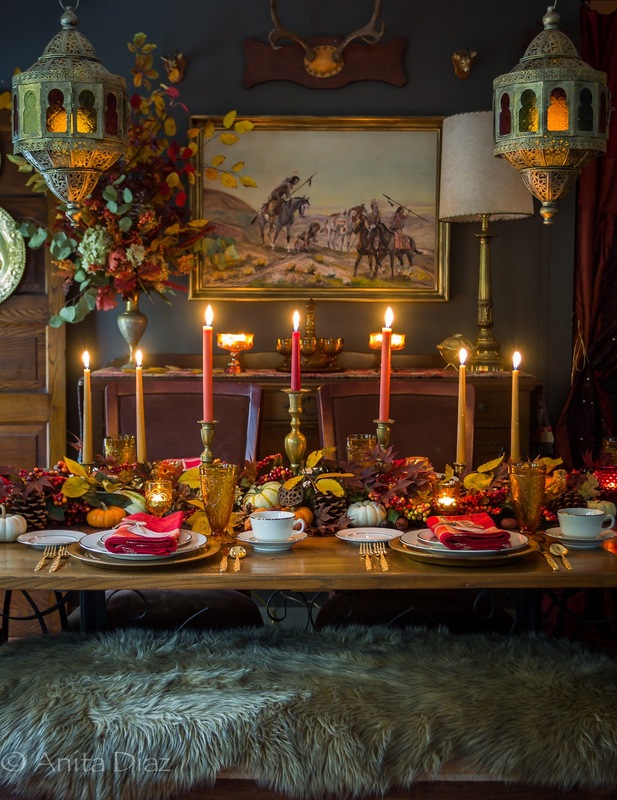 If so, I hope today’s Creative Thanksgiving Tablescapes post will inspire you. This soothing color palette by Pink Peppermint Design is so lovely. The “Blessed” napkin rings truly captured my heart. It’s no secret I adore color and Dimples and Tangles never fails to deliver! I had never thought of using gray on a Thanksgiving table but Hymns and Verses makes it work beautifully. I love tablescapes that color a bit outside the lines. The leopard paper napkin rings used by Our Fifth House pair perfectly with plaid. The layers of texture and color accented with a Morrocan touch by Far Above Rubies is truly enchanting. 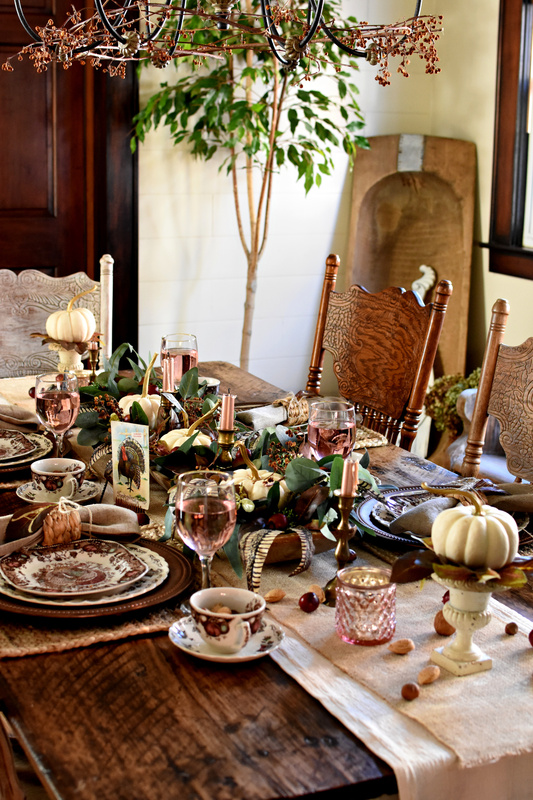 I poured over every single image of this tablescape created by Follow The Yellow Brick Home. It’s a delight to the senses. 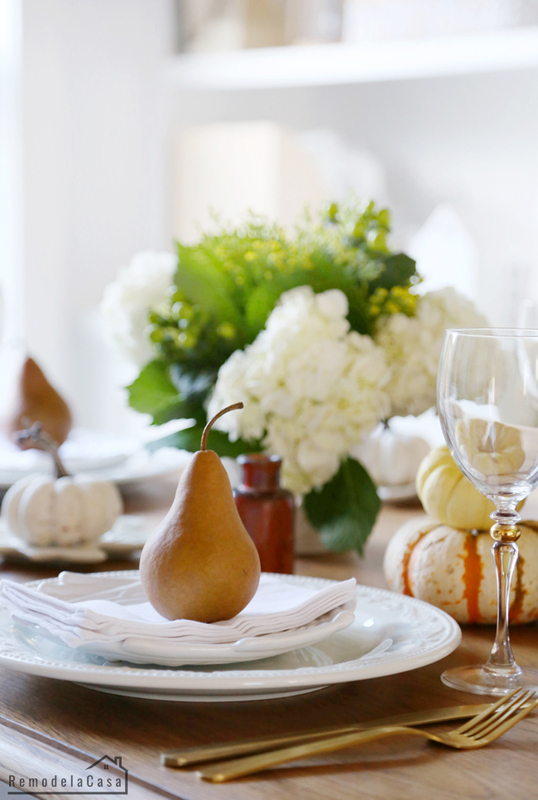 The simple pear accents combined with the amber bottles easily transforms an all-white tablescape at RemodelaCasa. A sprig of rosemary makes each individual place setting special at The DIY Playbook. 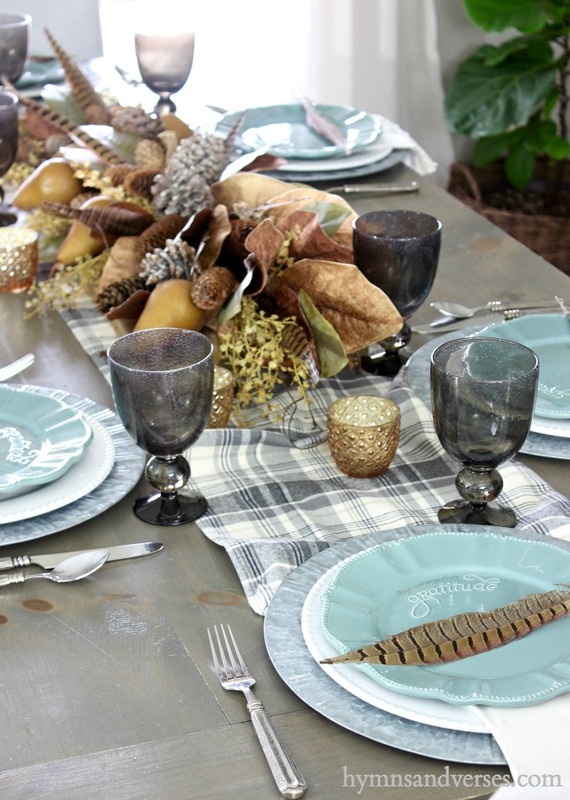 Are you traditional or modern in your Thanksgiving table decor? Beautiful tablescapes Laura! It’s so nice to see such a nice variety to get the creative juices flowing! I love Thanksgiving and the wonderful memories it brings from my childhood and the family dinners at my mom’s or my grandma’s houses. My favorite dish was my mom’s acorn squash which I make now. Have a blessed upcoming Thanksgiving sweet Laura! I love Thanksgiving and I hate to see it rushed over, especially when it’s early, like this year. Yes, I am definitely with you. We need to fully celebrate this season of thankfulness rather than gloss over it on the way to Christmas. So important for us to take a national day to be grateful……. Laura, I can’t even figure out how Thanksgiving turned into FOOTBALL for so many people. All of our homey rituals shouldn’t be lost. Lovely tablescapes, Laura. I agree – our special Thursday shouldn’t vanish and blend into Christmas. This is a most beautiful time of year, meant to be enjoyed and savored. So much to look at and enjoy here. Well, I like to combine Christmas and Thanksgiving. 🙂 To me, Thanksgiving is part of the Christmas season. As mentioned before, I keep my table pretty simple because 4 cats means you can’t really have all of those tempting items out on the table. Cats don’t listen to rules, ha. 😉 I like some of those non-traditional color schemes shown for Thanksgiving (and Christmas) though. I tend to lean always towards incorporating rough items of nature into my decor, whatever the season. I love Thanksgiving even better then C’mas now that we are empty nesters. When I was growing up in NY it wasn’t or it didn’t seem as it was so close to C’mas, besides it wasn’t a crazy time. After it we would fix the house and the tree and that was it. Time in between Tksg. and C’mas it also seemed as it lasted longer. 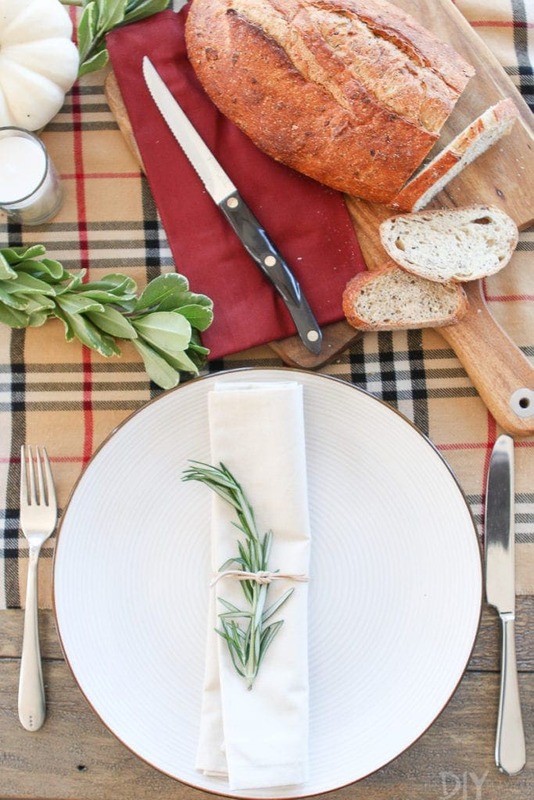 Beautiful tablescapes for the Thankful celeb. I too posted how my table will look. There is no celeb here in Ecuador, but I always have and now with so many American ex pats that live here, there is sort of things going on on some restaurants besides I’m sure ex-pats celebrate as well. Happy Thanksgiving season to you and yours. I’m reading back to all the posts that I’ve missed, so much beauty Laura! I love coming here.